A lot of wasted potential. win Sector is an exercise in mediocrity. The story, controls, gameplay elements, and characters are things that have been done elsewhere, and better. The graphics of the game are, honestly, extremely dated and uninspired. The writing is just bad, and the acting is worse. What could have been an interesting entry in the first-person puzzle genre is, instead, a third-rate game that feels rushed and lacking in effort. The story, while certainly not groundbreaking or original, is solid. Humanity has been forced underground into cryogenic freezing chambers, and a twist of fate and a sentient computer program named OSCAR conspire to awaken you, the player, prematurely. You wake up with amnesia, unable to remember your family, your life, or anything prior to your cryosleep. 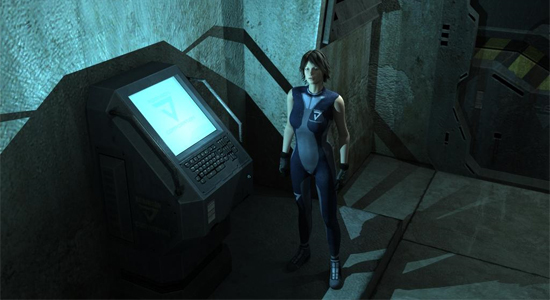 There's a crisis with the life support systems, and Nine is spurred into action by OSCAR in order to save the remaining population from suffocating in their cryo chambers. Like I said, it's not original. But it's not bad, either. Given some good writing and some good acting, an unoriginal story can be amazing. The problem is, there's neither of them in Twin Sector. Look familiar? If you've played Portal, you've played the far more successful game that Twin Sector imitates.The main gameplay element in Twin Sector is the pair of gloves that Nine wields, which act in a very similar fashion to the gravity gun in Half-Life 2. The left hand can attract objects, while the right hand can repel them, allowing Nine to hurl barrels into switches and that sort of thing. In a clever twist on the mechanic and one of the only redeeming factors about the game, Nine can also use the gloves to pull and push herself around the environment. She can use the left glove to climb by pulling herself up to ledges, and use the right glove to cushion herself in the event of a fall by repelling off of the ground. The gloves are used to manipulate the environment, solving puzzles and removing obstacles all so Nine can keep moving forward. Barrels are hurled into switches, glass walls are shattered by heavy boxes, turret are blocked and knocked over by crates, all while the sentient computer program OSCAR spurs you onward. Is any of this starting to sound familiar? If you've played Portal, you've played the far more successful game that Twin Sector is imitating but failing to duplicate. In all the regards that Portal succeeds, Twin Sector disappoints. Take the gloves, for example. Unlike the portal gun, which is a joy to use throughout Portal, using the gloves quickly becomes more of a chore than they are a boon. Each glove has its own power gauge, which only allows for a few bursts of grabbing or repelling before they're exhausted and require a few second's recharge. This leads to a lot of waiting while you figure out the various puzzles and sequences in the game, and it feels like a largely unnecessary addition. In sections that require you to jump from ledge to ledge in a short span of time, like say while a laser grid is deactivated by a button press, it goes from a mere nuisance to a major frustration. Now let's talk about OSCAR, the game's robotic sidekick (or is he?). The voice acting for OSCAR is some of the worst I've ever heard in a video game. Instead of sounding computerized or robotic, it simply sounds lifeless and wooden. Some might argue that a computer voice should sound lifeless and wooden, but to those people, I point to GLaDOS. OSCAR simply lacks any kind of personality or vibrancy, due to both bad writing and bad voice acting. Nine, the main protagonist of the game, isn't a whole lot better. This is yet another example of an interesting premise and interesting characters shortchanged by hammy, uninspired writing and dead, effortless voice acting. Too bad: interesting characters are shortchanged by hammy, uninspired writing and dead, effortless voice acting.Graphically, the game looks like something from six years ago. The loading screen, a zoomed in facial shot of Nine, the game's protagonist, is something straight out of the Windows 95 days but with a slightly higher polygon count. Aside from lacking in quality, the game also lacks in originality and inspiration. Hallways and corridors are full of fans, rusty metal, and barrels, but those elements have been around for decades now. Twin Sector brings nothing new to the table in this regard, and the complete lack of intentional design leaves the game feeling empty and dull. It saps each step of the purpose and gravity that other, better games have in spades. It's also just weird and contrived in some places. Who puts vital emergency switches on the ceiling, anyway? Really, Twin Sector is lacking inspiration throughout. It doesn't matter that the game has an unoriginal story, or a copied style, or a similar protagonist. We've been dealing with these kinds of recycled elements for thirteen Final Fantasy titles now. What allows the Final Fantasy franchise to keep going is good writing, great characters, solid gameplay, and great art. Twin Sector lacks all of these things, and ultimately it's an easily forgotten title because of it. There was definite potential in the source material, the characters, and the gloves, but it was all wasted. Twin Sector is utterly forgettable. Over the years I've become awfully sensitive to a game's quality of writing and voice-acting (or lack thereof) — so much so that success or failure can weigh heavily in my judgment. If it's a part of the game, story matters. Agreed, Jace: imitation is pointless if it fails to bring something new to the table. Nirvana's rendition of Bowie's "The Man Who Sold the World" and Mark Kozelek's KISS covers are brilliant not because they're rote reenactments, but rather entirely new creations based on their original works. We've all played videogames that blatantly attempt to cash in on a tried formula. Products like these deserve bad marks — it just may convince EA to give the small developer with the next "crazy idea" a chance. One-Liner: Should the Lines be Blurred?